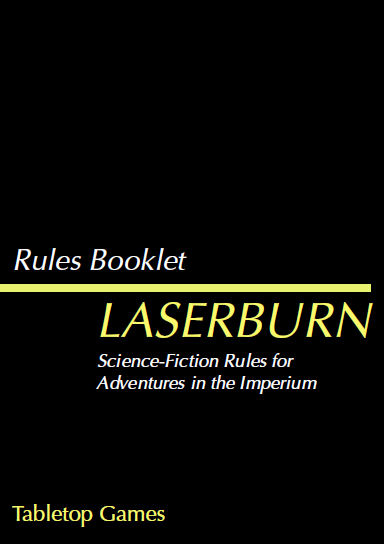 For a bit of fun, I’ve been having a look at the Laserburn books and as their size is roughly similar to the Classic Traveller LBB’s (Little Black Books), I got thinking what if the Laserburn books were in the same format as the LBB’s? I’d already got a Microsoft Word format document that was set up for generating LBB-style covers, so I compiled a list of the Laserburn rules plus a number of adventures and scenarios. The only issue I found is that I ran out of space when editing the cover for ‘Advanced Laserburn and Aliens’ and had to split it in two. Something I’d like to make clear – this is purely a bit of fun in re-imagining some book covers and is in no way a challenge to any copyright by the respective owners. I haven’t included any fan-made books that can be found on the internet, just the ‘offically-published’ books and mentions of titles within the books themselves. In some ways it is a ‘tribute’ to the LBB style that they continue to attract players and also Laserburn, in that many people have fond memories of playing it. I picked the off-yellow as a nod to the colour of the original Laserburn rules. Now, the following books could be considered as rulebooks (hence fall into that format with no colour bands across the top and bottom), but I decided they would be classed as supplements and they look a bit more colourful for it. Supplement 1: Forces of the Imperium: I’m not entirely sure what order the Laserburn materials were released, so I’ve picked a book and assigned it a supplement number. Next we have ‘Supplement 2: Imperial Commander’. Supplement 4 is Advanced Laserburn – normally this would have ‘…and Aliens’ but the font for that line is too big and reducing it in size wouldn’t look right. So I took the decision to split the book in two, so we have for Supplement 5… Aliens. 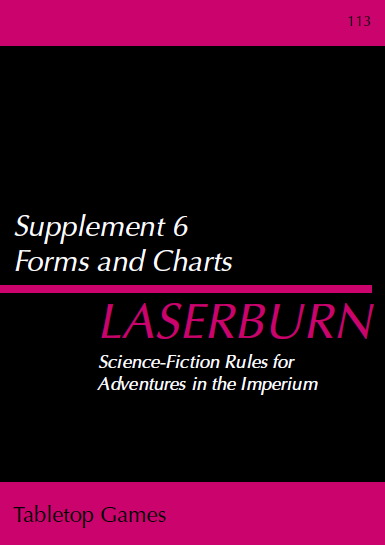 Supplement 6 is a forms and charts book which would also contain the templates for the weapons in 15mm and 25mm scale (bit like the Classic Traveller book). Onto the Adventures… I started with ‘Assault on Bunker 17’ as it felt like the natural choice to kick off the adventures list. 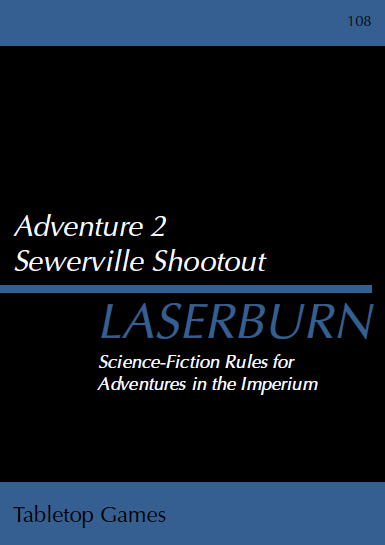 The second scenario is ‘Sewerville Shootout’. The third adventure is ‘Tarim Towers Heist’. 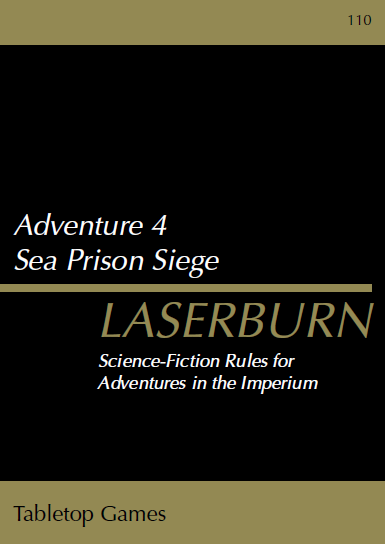 Fourth (of the actual published adventures) is: Sea Prison Siege. Fifth, which was never actually published I’ve assigned to the classic ‘For a Few Gonads More’. 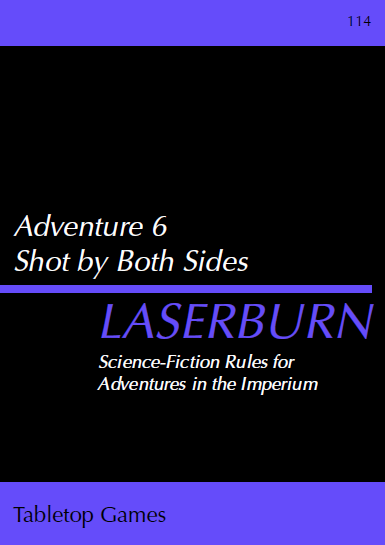 The sixth (also unpublished but mentioned in the Laserburn rules book) adventure is ‘Shot by Both Sides’. Unfortunately I couldn’t get ‘Encounter at Spagetti Junction’ onto the one line so I’ve left that one out. The final adventure, which was a published solo, is ‘Scavenger’. 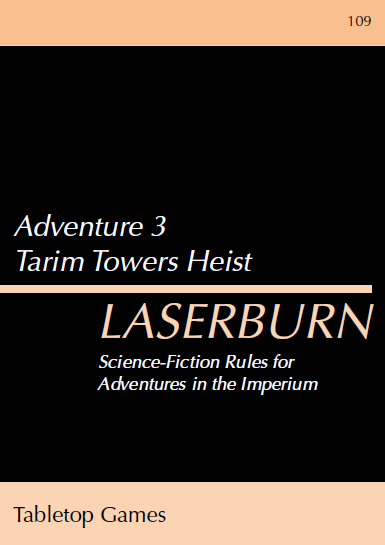 There you have it, my re-imagining of the Laserburn covers in the style of the Classic Traveller LBB’s. 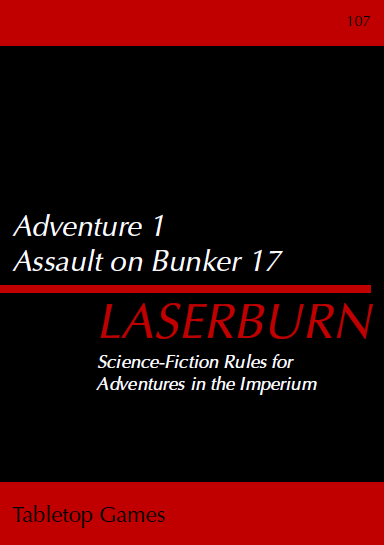 You never know, someone might put together a Kickstarter for the Laserburn rules and use these for a bit of inspiration. If you do, if you wouldn’t mind sending me a copy, it would be much appreciated…!! This entry was posted in Laserburn, Old School Gaming and tagged Classic Traveller, Laserburn. Bookmark the permalink. Please, share that Word template! I’ll get the template posted this weekend, the Optima font is still available (checked on Zhodani base) so I can put together a ‘package’ if you want to generate your own LBBs using MS Word.